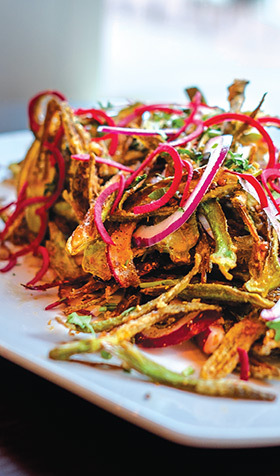 Intricate and Layered: The Kurkuri Bhindi fried okra. Hours: Lunch and dinner, Tuesdays-Sundays. Parking: Two hours validated self-parking in next-door garage. Remember when “fusion” became dining’s dirty word? It’s no wonder today’s chefs avoid the term like day-old sushi nachos. Still, the trend may be back – but this time, instead of “cold,” think “nuclear.” Rather than the old cultural mish-mash soldered together for Americanized tastes, now we’re seeing an alloy fully fused from a molten core. Like, say, a melting pot. Something about the Southern climate invites Asian experimentation: Heirloom BBQ serves traditional barbecue with Korean-infused sides. Sobban, in an old Arby’s on Clairemont Avenue, calls itself a “Korean/Southern Diner,” offering both bibimbap and kimchi deviled eggs. Poor Calvin’s in Midtown intersperses familiar Thai favorites like tom yum soup with pimento cheese and the cheekily named entrée Duck Dynasty. Tabla, a Midtown spot open since spring, is another welcome foray into this homegrown trend, its of-the-moment direction evident as soon as you open the door. Just beyond the host’s station, clean modern lines extend through a colorful bar lined with white leather chairs and a few banquettes. Beyond the lounge, in the small dining room, a chandelier hovers over tables like a scuba diver’s bubbly exhalation. Intimate, Indian (named for a drum) and exceptionally friendly, Tabla offers a well-edited menu. You’ll find many traditional Indian dishes, including curries, biryani, vindaloo and tandoori, but a few others also stand out: Ginger mashed sweet potatoes. Masala mac and cheese. Truffle oil and Parmesan naan. Cocktails are particularly ingenious mashups: The Chai Old Fashioned, with tea-infused whiskey. The Delhi Mule, with ginger-spiced infused vodka and ginger beer. The Tabla margarita, made with tamarind paste. On our first visit, we sat nearly alone in the dining room. Our waiter patiently walked us through our options, and as the cocktail shaker rattled, we watched through a large window into the kitchen as the chef began preparing our appetizers. Our waiter again materialized – to proffer the chef’s invitation into the kitchen to watch him make our naan. We stood by as he expertly shaped and patted the dough and then placed it on the wall of his tandoori oven. Moments later, we were ripping apart the brown, bubbly bread and topping it with the tandoori shrimp appetizer, flecked with lime, coriander and roasted garlic. It went well with that Chai Old Fashioned (even if the small tea leaves startled us at first) and a Kachumber cooler, of cucumber, gin and cilantro. We loved the lamb vindaloo, with chili and vinegar, and the duck tikka, with a pungent mango-mustard chutney. Both are more fragrant than bold; still, the spices are intricate and layered – complex but not walloping. A plate of thin-sliced, crisp-fried okra with red onions disappeared quickly; so did the grilled scallops with garlic and mint. I was mildly disappointed in the tandoori chicken, which seemed uninspired and bland compared to our other selections. I also preferred the bullet naan (with onion and jalapeño) over the truffle-oil/Parmesan version – a combination that just didn’t work. And while the masala mac and cheese was amusing, it seemed neither East nor West (nor South). Perhaps my favorite was the banana-leaf-wrapped mahi with tomato chutney. Another not-quite-there-dish was a dessert of chocolate-covered kulfi, frozen so solid we couldn’t eat it. When the kitchen cut it up for us, the flavors were underwhelming. By our second visit several months later, Tabla had caught on in a big way. The dining room was so crowded, we wished the spare décor included wall coverings to help absorb the raucous clatter. Our sweet waiter was helpful, but sometimes a bit out of his depth – he appeared just before we left with a second bill, as he’d forgotten to charge us for wine. Still, even with the uproar of a full dining house, it’s satisfying to see the kind of crowd Tabla draws – diverse, cosmopolitan, adventurous. Just like the food.